Ambience is a reverb that rivals the quality of the best commercial reverbs. You are free to decide yourself how much you want to pay for it, and when. On my laptop the dsp load seemed pretty good. And the effect itself has a really nice sound to it. This nifty little reverb comes with lots of presets and is fairly easy to use. 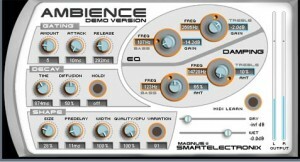 A nice little edition to the many free vst plugins available.